Philips Fidelio Primo DS9010 review | What Hi-Fi? The Philips Fidelio Primo DS9010 is essentially the DS9000 that was launched a while ago but with a “premium design finish in anodized brushed aluminium”. It certainly looks the part and, despite not having wireless support out of the box, has plenty of interesting features to set it apart. First, it’s made for iPod, iPhone and iPad – and not many docks can claim certified support for Apple’s tablet. What’s more, Philips claims any compatible Apple portable can be safely docked without having to remove its case. As soon as you dock an iPhone, iPad or Touch you’ll be made aware of another feature. Take the DS9010’s advice and you’ll be guided to download the Fidelio+ app, free. 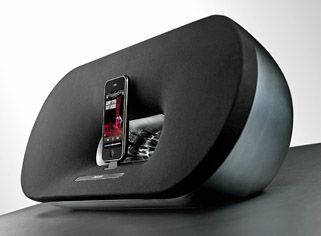 It brings a host of functions, including internet radio. Philips’ eye for style helps set the dock apart, too. It’s a relatively large unit, but thanks to some nicely drawn curves and that smooth finish, it feels less imposing in our listening room. The volume controls on the dock are backlit with proximity sensors, so the lights glow as your hand moves to touch them and fade out once you move away. As Philips points out, the ability to turn off any display is important on high-end kit – so all power can focus on sound reproduction. There’s also a 3.5mm input and a remote control not unlike a stretched version of B&W’s pebble-shaped remote that feels nice and offers complete iOS interface control. The Philips is capable of scale and volume. Kuedo’s Starfox gives any system plenty to think about and the 9010 holds on admirably, keeping control of the wonky beats and shifting plenty of air for low frequencies. It will go loud, but be prepared for a little loss of composure. The shiny synths start to toughen up a little and bass notes start to flap. Something more delicate, Fleet Foxes’ Bedouin Dress, shows the Philips capable of taking lighter steps – but it’s not quite as agile and revealing as the very best here. This is a stylish, well put-together, well thought-out piece of kit, with the fully functional remote and app helping increase the customer satisfaction. But it’s left in the second stream sonically and, without a wireless option out of the box, it’s the affordable price as much as anything that keeps it in contention.